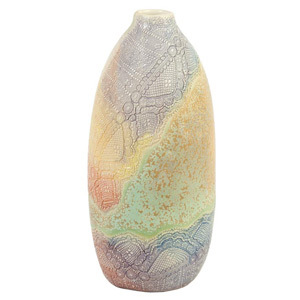 The talented studio ceramists craft this beautiful vase by hand with fine stoneware ceramic. The exterior features an intricately engraved pattern dressed with the colors of a rainbow. In any case, due to the handmade nature of this vase, no two pieces will ever look exactly the same. 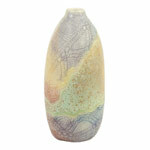 This vase may vary slightly in colors, motifs, shape, weight and size. The exterior may also show some small flaws in the glaze. This unique product is designed and handmade in a famed ceramic studio in northern Thailand. The master designers and artisans have acquired a world of knowledge for 20 years. Their collections fuse eastern and western styles, philosophies and techniques to create unique and diverse stoneware ceramics.